Wincess Corp is established in 1961 as a working glove manufacture in Kagawa, Japan. At the beginning of 1990′s, we sifted our main prodution lines to subsidiary companies in overseas and started manufacturing various kind of cut and sewn gloves and wears. Around the same time, the R&D team in Japan developed a unique seamless glove for cleanroom, which has been strongly supported by semiconductor manufactures worldwide. Our dedication to gloves and a clear focus on quality maintenance have won a high reputation and establish mutual trust with clients. There are countless numbers of heat resistance gloves. However, most of them are over engineered and too costly. Under ordinary circumstances, people do not require to resist 500 or even 300 degrees C. In addition, some of those gloves are can not actually used in a clean environment as they produce a lot of particles. Moreover, some material use silicon, which is not suitable for cleanrooms. It happens because there is no material that has a practical heat resistivity, has no particles, no silicon, and is in a reasonable price range. Clean, with excellent durability. They are sewn with the tips of the fingers folded back twice, which eliminates dust and particles falling from the cut part. The fingertips folded back twice so the cut part is not on the outside, and there is no dust or particles. Also, these gloves are incredibly durable. Polyurethane laminated conductive fabric eliminates dust and static discharges at the same time. They do not have to be thrown away after use, these gloves are reusable. Use the Earth’s resources carefully, and reduce waste from the factory. For each lot of fabric, the mould is changed and the sizes are perfectly maintained. We can handle customerordered sizes, materials, types, and OEM. Preshipment laundering / dustremoval treatment is possible. We supply gloves with reduced dust and particles for those who want to use them in an even cleaner environment. Direct shipmet possible from China to your country. Those gloves can be used with antistatic finger cots. We can handle made to order sizes, finger length, materials, types, and OEM. Dust does not come out, but vapor does. Release no dust to a cleanroom or contamination control environment. 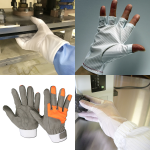 The white gloves are not just suitable for highclass cleanroom, also good for operators and our environment. Small quantity and trial order can be accepted. The gloves have an excellent durability as well as agility. Provide firm grip even in a wet condition. Used for various purposes. For each lot of fabric, the mold is changed and the sizes are perfectly maintained. Direct shipment possible from China to your country. Food processing machines for dumpling, noodle and more – Sanseidou Co., Ltd.